Ahh Christmas, season of meat, fat and sugar. We may look forward to it but after several days of excess even we carnivores start to yearn for a meatless day. The new year has arrived and this is the perfect antidote to over-indulgence. We may have passed our shortest day in the northern hemisphere but that only marks the start of true winter in the UK. Our options for home-grown vegetables shrink, including for those of us who are lucky enough to have an allotment, and thoughts turn to warming soups. With a good mix of vegetables, some beans, bread, a little cheese and a big hit of iron-rich greens, you have a whole nutritious meal in a bowl. What's more its flavours simply get better should you have any leftovers for the following day. The Italian word ribollita means re-cooked, or re-boiled, and in Tuscany refers to a dish of leftover minestrone with the addition of cabbage and bread. 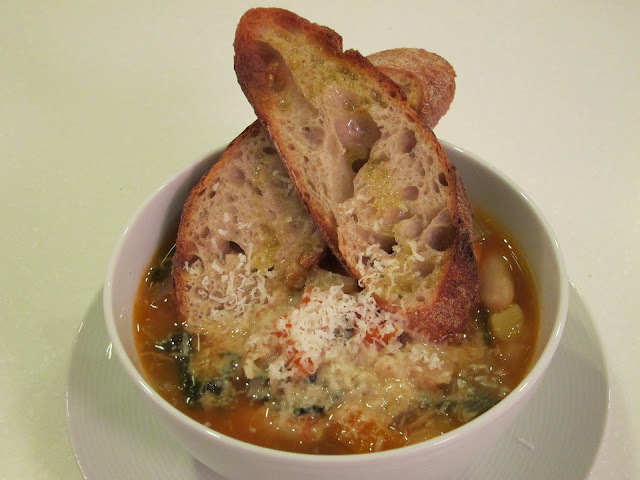 I prefer to make it from scratch as I like pesto and pasta in my minestrone but prefer my ribollita without either. I also like to grate just a little parmesan over my ribollita which would make some people throw up their hands in horror, but I agree with chef Jacob Kenedy. In the introduction to his BOCCA Cookbook he points out that in Italy "...each city, hamlet and household has its own version of a dish ..." and "...it would be a hard task to find two ... who could agree on how to make (it) ..". So this is my version of ribollita and I admit to some culinary licence. It's not prescriptive and if I have other vegetables to hand which I think will work, I will use them - celeriac or squash perhaps. The soup should be quite thick and hearty. The bread can be completely submerged in the liquor, which is more traditional, but I prefer to keep its crunchy texture so go for the half submerged option. Ribollita, the perfect way to banish all memories of turkey or goose for a twelve-month. Having first prepared your beans, fry the onions carrot and celery on a medium heat for 5 minutes. Add the leeks, garlic and the potatoes and fry for a further 5 minutes. Add the plum tomatoes, broken up, with their juice and add water to fully cover the vegetables. Add the cooked beans, bring to the boil, season, then simmer for 30 minutes. Add the cabbage (and diced courgettes if using) and simmer for a further 15 minutes, top-up with more water if necessary but keep the soup quite thick. Check your seasoning. Allow the soup to cool a little to appreciate the full flavours. When ready to serve, fill the bowls, top with toasted sourdough bread (or pour the soup over the bread) and a good slick of your best olive oil. Put parmesan on the table for anyone who wants it.